Blacksmith Tom Joyce makes monumental art the old-fashioned way, with the simplest tools and metals. Where most people might gaze upon a junkyard or an abandoned steel mill and see little more than rust, tetanus shots, and the wreckage of a bygone era, Tom Joyce sees creative potential and a multitude of connections through material. A blacksmith/artist, Joyce, 56, exudes an almost spiritual reverence for the way iron in particular—flowing through our blood, forged and reforged countless times as countless objects century after century—has the unique ability to convey layer upon layer of stories and meanings. For 2002’s Ash to Ash, a reliquary-like memorial given to a friend who’d lost a brother on 9/11, he developed a unique cast-iron alloy that included a vial of ash taken from Ground Zero, sand from a mandala created by Tibetan monks in Santa Fe, and some of the famous healing dirt from northern New Mexico’s Santuario de Chimayó. Small enough to hold in one’s hand (measuring 6 x 6 x 6 inches each), these sculptures referenced the vesica piscis, the fish symbol revered by Christians and Muslims alike, and are reminiscent of the golden rectangle so dear to ancient and contemporary followers of sacred geometry. With Joyce having demonstrated how gracefully he can blend spirituality, reverence, and deep meaning and emotion into something as seemingly simple as a hunk of metal, it made sense that, three years ago, Michael Shulan, creative director of the National September 11 Memorial Museum, in New York, commissioned him to forge the Memorial’s epitaph. 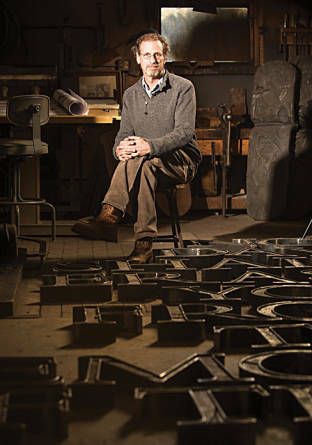 Given a quote from Virgil’s Aeneid—“No day shall erase you from the memory of time”—Joyce forged 3,500 pounds of World Trade Center steel into 16-inch-high letters that will hang in a single line along 100 feet of concrete wall separating the main exhibition space from a room housing the 1,400 human remains that will be forever entombed at the site. It’s a high honor in a career that is no stranger to them. A recipient of a 2003 MacArthur Foundation Fellowship, a 2009 New Mexico Governor’s Award for Excellence in the Arts, and, in 2011, the distinguished United States Artist Award, Joyce is a scholar and an artist whose work has been exhibited in the Smithsonian Institution, the Museum of Applied Arts in Moscow, and Paris’s Musée des Arts Décoratifs, among many other museums and galleries. That respect is both communally and personally motivated. Joyce and his daughters were in New York for an exhibit of his work, at the Museum of Arts and Design, that would have opened on 9/12. Early on the 11th, his older daughter, Kate, flew into Newark from San Francisco on the plane that, later that morning, became United Airlines Flight 93—which crashed into a Pennsylvania field. Joyce is the oldest of four children. His sisters are a graphic designer and a geologist, and his brother, who also lives in Santa Fe, is an art framer and works with clay. Joyce was born in Tulsa, Oklahoma, and accompanied his mother, a quilt maker, when she relocated to the farming community of El Rito in 1968. At 13, he apprenticed himself to local printer and blacksmith Peter Wells. “When I was 14 and learning to forge iron, I remember a distinct feeling, as though elder blacksmiths were looking over my shoulder and at times guiding my hands,” says Joyce. Two years later, he was offered the shop, dropped out of high school, and took up metalsmithing as his vocation. He also taught himself. Plenty. “I learned by examining historical objects and figuring out how things are made,” says Joyce, who haunted the Museum of International Folk Art, the Palace of the Governors, and flea markets everywhere. “The historical objects I encountered were perhaps my most timeless teachers.” His forge-shop-home compound, which he designed and built with family and friends, is a testament to everything he’s learned. It’s self-sufficient, it’s private but accessible, it’s quiet. Developing a market for his blacksmithing when he moved down to Santa Fe from El Rito in 1977, Joyce never lacked for work. He proved as adept at forging architectural ironwork for people’s homes as he was at building and repairing farm machinery. He made gates, grillwork, railings, lighting fixtures, furniture, bowls—and simultaneously went beyond the utilitarian, exhibiting his artwork in galleries and museums throughout the country. For over 30 years, he trained studio assistants, apprentices, and blacksmiths. Working now only on sculpture, he forges his monumental pieces outside Chicago in an industrial facility capable of handling larger material than he can at home. Never merely a recycler, Joyce uses specifically chosen materials that have had other lives, served other purposes—in times of war and in times of peace—and infuses them with depth, grace, and humanity. It’s why he agreed to forge the epitaph for the 9/11 Memorial. Devon Jackson, a freelance writer, is the author of Conspiranoia! (Plume).